A major battle was fought at Macroom between Cromwell’s forces led by Lord Borghill and those, under the command of Bishop Mac Egan, loyal to King Charles. The Cromwellian forces were victorious, the Bishop was captured and hanged in nearby Carrigadrohid. Six years later Macroom Castle was handed over to Admiral Sir William Penn. He retired to his Irish estates – the castle and manor 1660, the year of the restoration of the English monarchy. 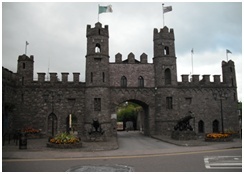 Later under the direction of Charles II Lord Muskerry McCarthy got back Macroom Castle and Admiral Penn received Shanagarry Castle in County Cork in compensation. Sir William Penn at the restoration of the monarchy he lost these lands and received an estate at Shangarry in 1667 in compensation. This estate amounted to 7,282 acres in the barony of Imokily and 4,859 acres in the barony of Ibane (formely Barry Rue). 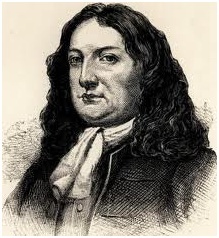 His son William Penn, a Quaker, founded the state of Pennsylvania in America after spending some time in county Cork in the late 1660s. The Penn estate in County Cork passed into the possession of the Gaskell and Durdin families. Sir William son is known, of course, as the founder of Pennsylvania. He is also known as a famous Quaker. We must remember that Penn was also a member of the landed gentry, and that despite his true interest in (relative) democracy and religious toleration, he was ‘proprietor’ of his Pennsylvania manor. He was one of the best known early Quakers here who came back in 1666 to manage his father’s estates in east Cork. When Admiral Penn went back to America he was instrumental on that state being a haven for Quakers. Over the next century, some 2,000 Irish Quakers emigrated to America, many of them settling in Philadelphia. 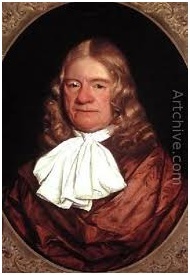 Springett Penn was a grand son of Admiral William Penn. The “Munster Records,” are the first authentic records of any Grand Lodge in Ireland, informing us that a Grand Lodge met at Cork on the 27th of December, 1726, The Honourable James O’Brien, third son of William 3rd Earl of Inchquin, being elected (3rand Master, and Springett Penn was elected Deputy Grand Master. On August 9th, 1731, Lord Kingston, who had been elected Grand Master of England 1728 was elected Grand Master of the Grand Lodge in Dublin. He had also been elected in 1729 Grand Master of the Grand Lodge of Munster; his acceptance of both important Irish offices served to fuse together the two bodies in 1731, into the Grand Lodge of Ireland as it stands to this day, proving the connection and good feeling then existing between the Premier Grand Lodge of England and the Grand Lodges of Ireland. Lord Muskerry McCarthy got back Macroom Castle. Thank you for setting the record straight. Following the Catholic revolt in 1641, the Confederate Catholics of Ireland met in Kilkenny in 1642 to organise their forces. The Confederacy was a coalition of Gaelic Irish and Old English, the descendants of the 12th century Norman conquerers, who had refused to renounce Catholicism.